Artificial transporter enzyme complexes improve sugar utilization in baker’s yeast. Making valuable products, such as fuels, synthetic materials or pharmaceuticals, from renewable raw materials is to date not efficient enough because the microorganisms used only process the raw materials very slowly and generate many by-products in addition to the substances actually wanted. Biotechnologists at Goethe University Frankfurt have now succeeded in optimizing sugar utilization in baker’s yeast. Microorganisms such as baker’s yeast can be compared to a miniature factory: the raw materials (generally sugar) are carried in through gates (transport proteins) and converted in a multi-stage process with the help of enzymes. By contrast to a man-made factory, in microbes not only technologically interesting products are turned out but also many by-products. This is due to the fact that various enzymes compete for the sugar so that different building blocks important for the cell’s survival are formed. Thomas Thomik and Dr. Mislav Oreb from the Institute of Molecular Biosciences at Goethe University Frankfurt have now succeeded in channeling the metabolism of baker’s yeast in such a way that sugar, as the raw material, can be used more productively. 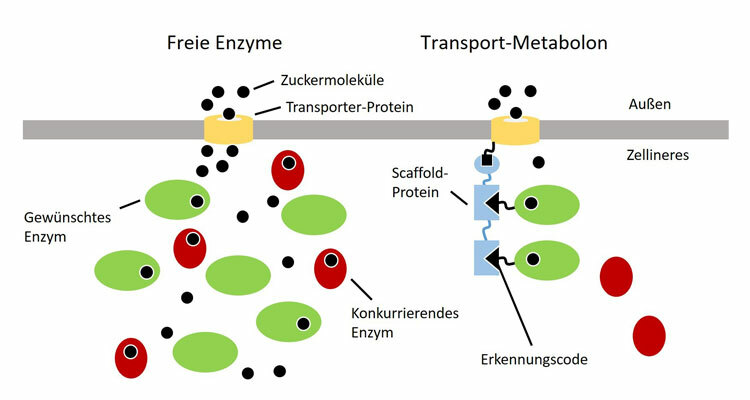 In the latest issue of the renowned scientific journal “Nature Chemical Biology”, the researchers present a new mechanism with which the raw materials are delivered directly to the desired enzymes by transport proteins. In their study, the biotechnologists show that the sugar xylose is converted into ethanol by such “molecular conveyor belts” (transport metabolons) more efficiently by minimizing the production of the unwanted by-product xylitol. “The underlying principle could be used to make any manner of product from various sugars, such as biofuels, synthetic materials or pharmaceuticals. The concept has the potential to make biotechnological processes generally more ecologically and economically sustainable, since efficient sugar utilization is a fundamental requirement for this,” says Mislav Oreb, explaining the significance of the new process. Further information: Dr. Mislav Oreb, Institute of Molecular Biosciences, Faculty of Biological Sciences, Riedberg Campus, Tel. : +49(0)69-798-29331, M.Oreb@bio.uni-frankfurt.de.